SUBMISSION PROCESS FOR SEASON 16 IS NOW OPEN! Deadline for Proposals: June 1 for each upcoming season. Exhibition Season begins late September. Selection of artists is made and season lineup planned (including solo dates) by end of July. Each solo exhibit will then be curated in conversation with the artist within several weeks of their assigned exhibition dates. After reviewing the full prospectus below, find the required application form here. On average, one-third of Manifest's exhibits are dedicated to solo exhibits. Solo exhibitors have included local, regional, and national artists from as far away as New York City, San Francisco, Canada, and Hong Kong. It is important to our non-profit mission that each of our seasons of free public exhibits consist of a balanced mix of solo and group thematic projects. The group shows provide diversity of approach, media, style, and geographic origin, while the solo exhibits provide a deeper insight into an artist's vision. Over 300 artists exhibit (through group and solo shows combined) and over 4000 patrons visit the gallery each year; thousands of artists submit works to thematic projects produced at the gallery. Our exhibits are routinely reviewed in local and sometimes national news and art publications (including Sculpture Magazine, Drawing Magazine, and Art Papers among others). And while our focus is on providing a museum-like experience of visual art, patrons and collectors, including museums, watch Manifest and our publications for future acquisitions and exhibitors. We believe this makes the spots in our schedule reserved for solo or proposed exhibits highly valuable. Manifest is happy to receive proposals of various types and accepts these on an ongoing basis starting usually in late winter, reviewing them starting in early June in consideration for the upcoming exhibit season. No notifications are made until the final season schedule is decided (usually by the end of July), but updates are sent to all artists at the start of our committee's review process. Our organization is a 501(c)(3) charitable non-profit and as such operates on a very lean budget with the support of hard earned grants as well as individual donations to our Annual Fund and in-kind professional services. As such, all submissions to gallery calls and proposals for exhibits include nominal entry/application fees. These are either at or below the national norm for such fees, and we work very hard to maximize all our resources to make the benefits of submission to and participation in our exhibits more valuable than most gallery experiences. The fact that Manifest's non-profit operations are supported in-part by entry fees does not mean that Manifest is a vanity gallery. With a mission to stand for quality in the visual arts, and to serve as a bridge between the community and the highest forms of visual expression, we set our own bar high and generally exceed the expectations of both the exhibiting artists and our patrons with what we do. - Group shows (while our strong preference is for solo exhibits, we have considered and accepted group proposals in the past). *NOTE that our curatorial process also considers the possible combination of solo proposals into small selective group shows when possible, and agreeable to the artists. Eligibility: Anyone can submit a proposal. Artists should bear in mind the need for a consistent and very strong body of work when submitting. Media/Genre, etc: Open to all traditional and non-traditional genre and media. Manifest sets out to survey, select, exhibit, and document excellent quality amongst all types of art. Our record of showing a broad mix speaks for itself. Cash Award Potential: The annual Manifest Grand Jury Prize will result in the awarding of one cash prize ($2500) to a single work selected as the 'best of the entire season'. The winner will be determined by a final end-of-year jury from among a pool of all top-scoring works from each exhibit's jury process across the exhibition season. Solo exhibitors will automatically have one work of their choosing (or Manifest's Director's choosing, should the artist wish it) from their exhibition included in the Grand Jury Prize pool for consideration. Details on the Manifest Grand Jury Prize can be found here. Jury and Curator: Manifest's main selection process involves a complex two-part system. Most group exhibits are juried by an anonymous volunteer panel of professional and academic advisors with a broad range of expertise. (Jurors include working professional artists, professors, artists from academia, and curators from across the U.S. and beyond.) The jury passes along their recommendations to the exhibit curator who makes the final selections from the jury-approved pool. Solo proposals are handled in a similar way. While artists may provide a specific goal for an exhibit, the final selection and layout of works will be determined by a Manifest curator (usually the Executive Director) in consultation with the artist. Publication: Through nine seasons Manifest Press produced 74 full-color catalogs documenting the works selected for every exhibit presented in our galleries. Starting during Season 10 (2013) we shifted to the design of one much larger high quality hard-cover publication documenting each entire season of exhibits, artists, and works shown. This continues and escalates Manifest's commitment to long-term documentation and dissemination of our projects, and the expansion of physical exhibits into a broader geography and time frame, while also bringing all exhibits together under one cover each year to create a better product which will be more valuable to the public, teachers, libraries, and exhibiting artists. Each season's book will be similar or larger in size to our INDA, INPA, and INPHA publications, and will be designed, printed, and distributed with the same quality and attention to detail. This does not replace those media specific exhibits-in-print, rather it complements them, and we think rounds out Manifest Press's publication suite perfectly. Each exhibiting artist who is a Manifest Annual Fund Supporting Member at the appropriate level* or above can choose to receive one free copy of the season publication. Exhibiting artists who are not supporting members at the specified level during the season will be able to purchase their copy of the season publication at half price. Solo exhibitors will receive one copy for free regardless of membership status. Visit Manifest Press to see past catalogs (the former style) and our award-winning INDA, INPA, and INPHA books, as well as details on the first MEA publication. *Become a supporting member of Manifest here. Delivery and Return of Work: Artists must cover the cost to transport the artwork to and from the gallery. All work selected for the exhibition must arrive ready to install. Works not gallery-ready, or not exhibiting good craftsmanship, may be omitted from the exhibit. Accepted work that differs significantly from the submitted images or suffers from poor presentation, will be disqualified. Please note that professional-level presentation is a must. Work may be hand delivered or shipped. Shipped works must be sent in an easily reusable container/packaging. Works will be returned in the same manner as delivered or via UPS/USPS. Exhibited work will remain on display for the duration of the exhibition. Works not claimed within 30 days of the end of the exhibit will become the property of Manifest. Insurance: Works will be insured while on gallery premises. Insurance covers theft, vandalism, damage caused by gallery patrons or staff (in accordance with and within limitations of gallery's insurance policy). PLEASE NOTE: Insurance does not cover damage caused during shipping due to any reason, including mishandling by carrier or failure of packaging to protect works in transit. Also not covered is damage caused to work by failure of the work itself, its mounting systems installed by the artist, or disintegration/degradation due to the nature/quality of materials or craftsmanship, or incidental damage to works whose artist-directed presentation methods put them at risk. The artist must be capable of providing proof of value in the event of any necessary insurance claim. In general we recommend artists to have separate insurance coverage on their artworks to ensure full coverage and protection while in transit, and as a supplement to gallery and other venue insurance. Submission Fee: Each proposal must be accompanied by a $50 non-refundable submission fee. Number of works is not limited. Fee must be paid by U.S. check or U.S. or International money order made payable to MANIFEST, or by credit card via PayPal. (If paying by PayPal PLEASE use the paypal link provided on the page that follows the submission of the online proposal form.) Detail images may be included, but only if necessary for understanding the nature or quality of the artwork. Manifest is a 501(c)(3) non-profit and state-funded charitable organization operated by artists, for artists, with no reserve or endowment. All proceeds from entry fees fund project-related expenses. Not unlike paying a fee to enter a marathon race, this democratically enables our organization's projects to take place. For a decade and a half Manifest has earned an international reputation for producing quality exhibits, and benefiting the artists involved over time on its meager budget. Our board of directors and small dedicated staff work hard to make involvement with Manifest projects well worth the effort and cost to do so. It is important to note that this jury fee is the only cost charged by Manifest for participation. For proposals we request 12 images be sent for consideration. If the proposal is accepted, additional images may be requested or offered for consideration and further discussion. For group proposals or solo proposals requiring more or less work for some reason, we can accept a different number than the preferred 12 for consideration. It is highly preferred for a majority of the works submitted to be available for exhibit if selected, rather than simply offered as a representational sampling of potential future work for exhibit. Our selection committee strongly prefers to know and see what it will be exhibiting before making the commitment. It is advisable that, when possible. submissions include 'in context' shots as details revealing how the work appears when on exhibit. It helps our committee to understand the physical nature of the artwork. Such images would be considered 'details' as per the instructions below. Sale of Work: All work, unless indicated as not for sale (NFS), will be available for sale during exhibit. 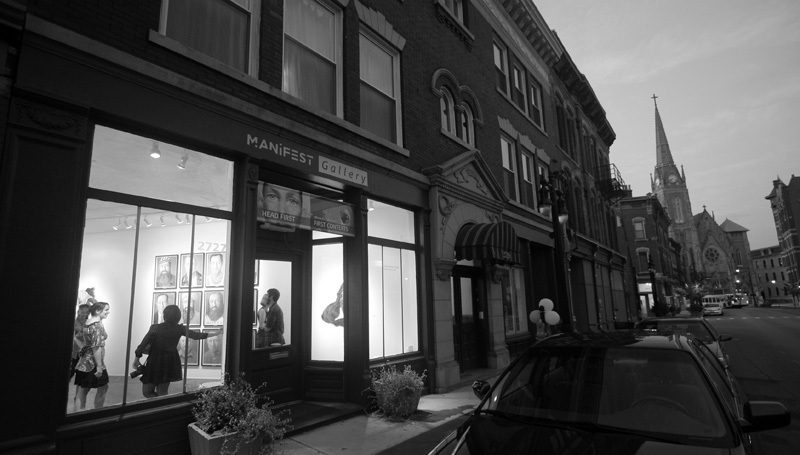 Manifest Gallery will retain a commission of 30% on all artwork sold during the exhibition. The artist sets the final sale price on the proposal form/agreement. Images and Info: Manifest accepts only digital images/files for consideration. See specifications below. The Gallery will retain the submitted images of accepted artwork and reserves the right to use the images in publications and gallery publicity. Beyond such use, the artist retains full copyright of exhibited work. Submission CDs will not be returned. Images must be oriented properly (i.e. top of image is top of artwork) and should not include text info or borders that are not part of the actual work. Any essential information regarding the nature of entries should be included in the notes section for each work on the entry form. Video links should be provided on the entry form for each work in the NOTES or VIEWING LINK section, and should link directly to online or downloadable content that does NOT require a login password or membership to view. These may be in the form of Youtube, Vimeo, Dropbox, or other similar links. Effort should be made to eliminate confusion or extraneous information that may interfere with the jury's viewing of the work. Any extraneous information, or material not considered to be 'the work' will inevitably detract from the jury score for that work. Submitting the entry form indicates that you agree with the conditions of entry and exhibit as outlined in this prospectus, that you are reserving spots in our jury, that you will send the application fee, and that you agree to make your work available and will ship/deliver it to the gallery should it be selected for exhibit. DO NOT submit an application form if you are not prepared to follow through. Artist's resume (if multiple artists are involved, include a resume from each) (e-mailed).